A new campaign by Bayer vitamin brand Redoxon in Singapore graphically shows subway commuters how a single sneeze can spread germs on public transport. 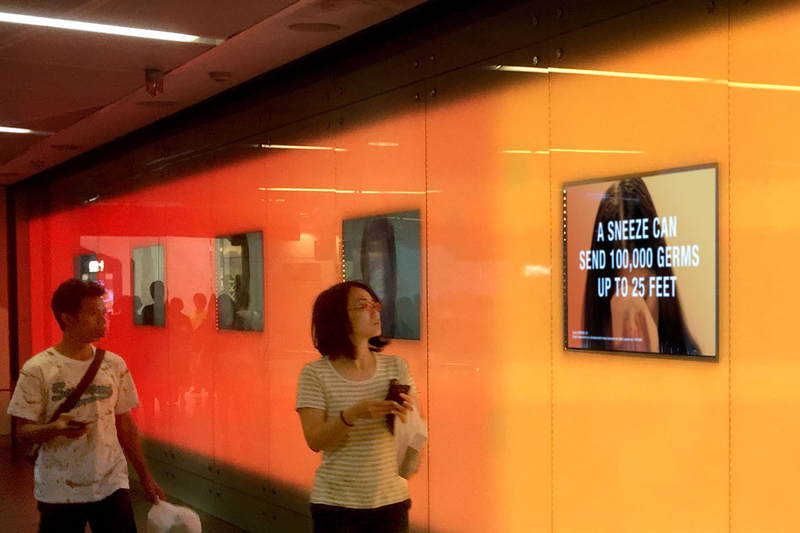 The outdoor campaign, created by JWT Singapore, is running in one of the city’s busiest subway underpasses, Orchard, with a series of digital outdoor screens that illustrate the spread of 100,000 germs over 25 feet with just one single sneeze. As commuters walk past, the sneeze goes "viral" and passes from screen to screen, showing different people catching the germs until the final screen shows a woman who has taken Redoxon and is sneeze-free. “At Redoxon, our continued efforts are focused on helping people boost their immunity to pre-empt and prevent everyday illness. With the September flu season almost upon us, we felt it timely to show people how rapidly germs can be transmitted virally, and to remind them how supplements and other healthy habits can help prevent flus and cold,” says Jerlyn Lim, Bayer commercial lead, consumer health Singapore. “People know prevention is better than cure, yet they don’t boost their immunity until they are sick. So we set out to show just how contagious a sneeze can be. We created a truly viral out-of-home brand experience by showing the impact of one sneeze over 25 feet”, adds Farrokh Madon, chief creative partner at JWT Singapore.